I worked as an aircraft mechanic on the Caribou in Vietnam 1970-71. And for me this painting brings out all the feeling, and emotion of a time that will forever last in my minds Eye. 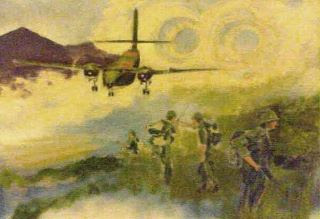 This painting captures the feel of the Caribou mission in Vietnam better than any art I have ever seen. Actaully I was floored when I saw it, so real, so emotional,a still in my minds eye from a time I remember so well. Going into fire bases with ammo loads was one of the missions the "Bou" did so well, on approach the flight crew would be watching for any ground fire other traffic such as low flying huey's , cobras and chinooks, while one pilot flew the other was on the radio, working the flaps, the gear, while the flight mech oppened the rear cargo door and undid all the tie downs except for one. On touchdown the props were put into reveerse and the old bird came to fast slow down in a cloud of dirt and dust. The crew would then change the flight settings for a quick exit from the base. 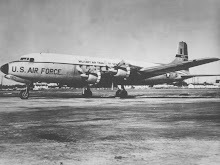 If there was no forklist to get the ammo off , the crew would reverse the props taxing backwards and then made a stop and moved forward the cargo which was already released by the flight mech would roll completely free of the aircraft. I witnessed this a few times out along the Cambodian border. What a time. Thank you Chris, What a Painting. !